Before earning her CDL, Debra never travelled more than 150 miles from her hometown on her own. She was a businesswoman immersed in her community, first running five local convenient stores and then an insurance agency. She also helped found her church’s annual Women’s Conference (which is still going strong). The decision to become an independent truck driver may seem out of left field, but in reality, she simply traded one type of business for another. Her son first turned her on to the idea of trucking. He also has his CDL and was a driver for several years before Debra decided to make the switch. He even offered to drive team with her. However, Debra politely declined, preferring to find her own way in the industry. Knowing she wanted to go over-the-road but not sure which company to choose, Debra earned every CDL endorsement except for passenger. From there, she spent a large amount of time researching trucking companies through brochures and websites. Eventually she chose TransAm Trucking because of the program and equipment. Once Debra sets a goal, she sticks with it. “If everyone else can do it, so can I.” Life over-the-road was not always easy. Being away from friends and family was a big change but Debra’s attitude helped her persevere. She focused on continually improving her skills even after her driver orientation was over. She took advantage every learning opportunity, calling Training & Development when she had questions and accepting offered help from fellow drivers. If you want to be good at something, “don’t stop learning”. 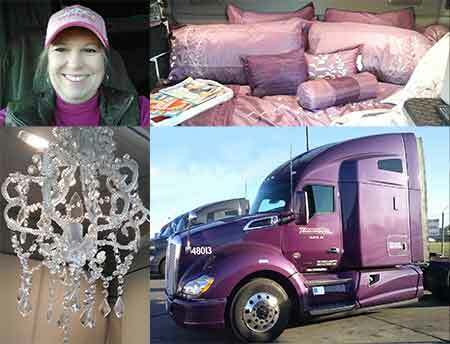 This is how trucking lead Debra to her new passion: facilitating. Debra’s family is full of educators so, being an independent spirit, teaching never appealed to her. Nevertheless, after her success over-the-road, the Director of Training & Development asked her to become a coach. She did not agree right away; taking on students is a large responsibility and Debra did not want to make the decision lightly. However, she did eventually consent to take on students. Debra really enjoyed coaching. She relished sharing her experience with her students and encouraging them to succeed. Her enthusiasm did not go unnoticed. Two years after being over-the-road, TransAm offered Debra a position on the Training and Development staff as the Orientation Manager for the Rockwall, TX terminal. Now she facilitates orientation for incoming drivers each week about trucking with TransAm. When she talks about her transition from trucking to teaching, she laughs. She never thought she would be a truck driver and she definitely did not plan on becoming a facilitator. Nevertheless, she is happy with where she ended up and is thankful to TransAm for getting her there. Thank you, Debra, for choosing TransAm Trucking! We are glad to have you as part of the team.